I've been dying to show you this outfit from last weekend. I got this jacket for my birthday (October) and I've only started wearing it now...it's so pretty that I don't want to ruin it! I'm sure most of you know this jacket - it's the most famous jacket from Equestrian Stockholm! I've seen dozens of photos of this jacket on Instagram and always thought it was beyond gorgeous. It has such a gorgeous color, although I have to admit I'm the biggest fan of pink, and it feels very cozy while still looking super chic...not to mention the softness of the fabric!!! Just like the brand refers on its website, it is foam padded and contains 25% of coffee oil in its composition - I didn't even know something like this existed! I also love the cut, it is 100% Carolina's style. However, there's something I can't stop thinking about, the jacket is so structured around the body, fits like glove and then you look to the sleeves and it almost makes me think that I bought the wrong size because they're too big. Well, I bought the smallest size so that can be the right answer...that's just how they designed it! I know the sleeves must large enough to accommodate layers but I think the jacket would look even better with tighter sleeves! I decided to wear my new training top by Hart Equestrian under the jacket. I'm also very impressed by the fabric of this top, it's very soft but with the vantage of featuring a sweat-wicking technology. I have no doubts, this one will be one of my best friends during Summer. For now, I'm just using it as a base layer and I wish I had a photo of its back because it's definitely the best thing about it but, unfortunately, it was too cold to take the jacket off - I promise I'll show it to you on my Instagram stories! What could be better than a #ROOTD with two of my favorite colors?! That's right, a #ROOTD with three of my favorite colors! This color looks so good on my grey that I had to get myself a belt that matches one of his saddle pads. 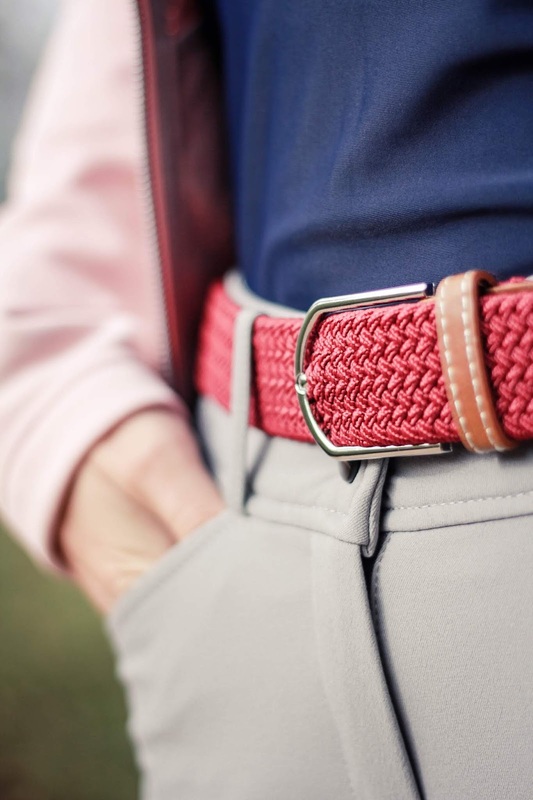 I've said this a thousand times but braided belts are the best for thin girls like me, sometimes I can't find a belt that's small enough but this type of belt always saves me - they fit everyone! Plus, they're the cheapest belts and have the biggest variety of colors. The one I'm wearing is also from Hart Equestrian.